Bertram Grosvenor Goodhue (April 28, 1869 – April 23, 1924) was an American architect celebrated for his work in Gothic Revival and Spanish Colonial Revival design. He also designed notable typefaces, including Cheltenham and Merrymount for the Merrymount Press. 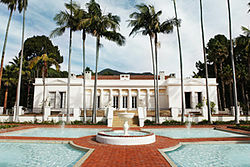 Later in life, Goodhue freed his architectural style with works like El Fureidis in Montecito, one of the three estates designed by Goodhue. Goodhue was born in Pomfret, Connecticut to Charles Wells Goodhue and his second wife, Helen Grosvenor (Eldredge) Goodhue. Due to financial constraints he was educated at home by his mother until, at age 11 years, he was sent to Russell's Collegiate and Commercial Institute. Finances prevented him from attending university, but he received an honorary degree from Trinity College in Connecticut in 1911. In lieu of formal training, in 1884 he moved to Manhattan, New York City, to apprentice at the architectural firm of Renwick, Aspinwall and Russell (one of its principals, James Renwick, Jr., was the architect of Grace Church and St. Patrick's Cathedral, both in New York City). Goodhue's apprenticeship ended in 1891 when he won a design competition for St. Matthew's in Dallas. After completing his apprenticeship, Goodhue moved to Boston Massachusetts, where he was befriended by a group of young, artistic intellectuals involved in the founding of the Society of Arts and Crafts - Boston in 1897. This circle included Charles Eliot Norton of Harvard University and Ernest Fenollosa of the Boston Museum of Fine Arts. It was also through this group that Goodhue met Ralph Adams Cram, who would be his business partner for almost 25 years. Cram and Goodhue were members of several societies, including the "Pewter Mugs" and the " Visionists". In 1892–1893 they published a quarterly art magazine called The Knight Errant. The multitalented Goodhue was also a student of book design and type design. In 1896, he created the Cheltenham typeface for use by a New York printer, Cheltenham Press. This typeface came to be used as the headline type for The New York Times. In 1891, Cram and Goodhue formed the architectural firm of Cram, Wentworth, and Goodhue, renamed Cram, Goodhue and Ferguson in 1898. The firm was a leader in Neo-Gothic architecture, with significant commissions from ecclesiastical, academic, and institutional clients. The Gothic Revival Saint Thomas Church was designed by them and built in 1914 on Manhattan's Fifth Avenue in New York City. In 1915, Goodhue accepted membership to what is known now as the American Academy of Arts and Letters. In 1917, Goodhue was elected into the National Academy of Design as an Associate member, and became a full Academician in 1923. When Goodhue left to begin his own practice in 1914, Cram had already created his dreamed of Gothic Revival commission at the Cathedral of St. John the Divine in New York City, and continued to work in the Gothic style mode for the rest of his career. Goodhue, in departed into a series of radically different stylistic experiments over his independent career. His first was the Byzantine Revival style for St. Bartholomew's Episcopal Church on New York City's Park Avenue, built on a new platform just above the Grand Central Terminal railyards. El Fureidis Estate in Montecito, California. Later Goodhue's architectural creations became freed of architectural detail and more Romanesque in form, although he remained dedicated to the integration of sculpture, mosaic work, and color in his surface architectural details. Towards the end of his career, he arrived at a highly personal style, a synthesis of simplified form and a generalized archaic quality, and those innovations paved the way for others to transition to modern architectural idioms. 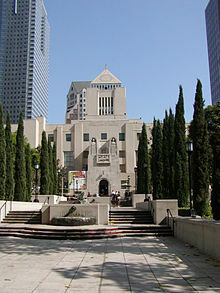 This style is seen in his last major projects: the 1926 Mediterranean revival and Egyptian revival Los Angeles Public Library; the Nebraska State Capitol; and in his 1922 entry for the Chicago Tribune Tower competition. Goodhue died in 1924 in New York City. He was interred within a wall vault in the north (left-hand) transept of his Church of the Intercession, at his request in the building he considered his finest. Architectural sculptor Lee Lawrie created a Gothic styled tomb for him there, featuring Goodhue recumbent, crowned by a carved halo of some of his buildings. He received the AIA Gold Medal in 1925. Over the course of his career, Goodhue relied on frequent collaborations with several significant artists and artisans. These included architectural sculptor Lee Lawrie, and mosaicist and muralist Hildreth Meiere. Their work is central to the aesthetic power and social messages implicit in Goodhue's best work. Lee Lawrie worked with Cram and Goodhue on: the Chapel at West Point, the Church of St. Vincent Ferrer, St. Bartholomew's, and the reredos at the Church of St. Thomas. Lawrie worked after 1914 with Goodhue's independent practice on: the Los Angeles Public Library, the Nebraska State Capitol, the Rockefeller Chapel at the University of Chicago, the National Academy of Sciences Building in Washington, D.C., and the Christ Church Cranbrook completed after Goodhue's death at the Cranbrook Schools in Bloomfield Hills, Michigan. After Goodhue's unexpected death in 1924, many of his designs and projects were brought to completion by architect Carleton Winslow Sr. in California, the successor firm of Mayers Murray & Phillip in New York, and other former associates. Goodhue's offices had employed, before they established their own independent practices and reputations, designers and architects such as Raymond Hood, Carleton Winslow Sr., Clarence Stein, and Wallace Harrison. Thematic consultant Hartley Burr Alexander, Lee Lawrie, and Hildreth Meiere reassembled in the 1930s for the Rockefeller Center project collaboration with Raymond Hood. 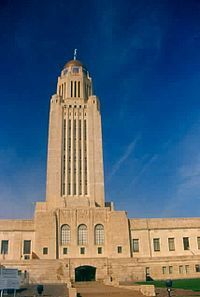 Along with Paul Cret and others, Goodhue is sometimes credited with being part of popularizing the art deco style in America, as in his design for the Nebraska State Capitol building, by which some may retroactively classify him as an early American Modernist. However, his dedication to the integration of art and architecture was exactly contrary to the spirit of Modernism design, and at least partly accounts for the academic and critical neglect of his work. A significant archive of Goodhue's correspondence, architectural drawings, and professional papers is held by the Avery Architectural and Fine Arts Library at Columbia University in New York City. 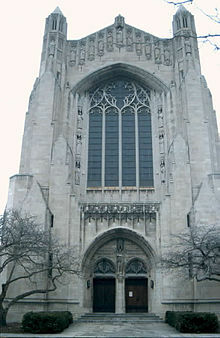 Oriental Institute, University of Chicago, Chicago, Illinois, commissioned 1919, completed in 1931 by the successor firm of Mayers Murray & Phillip. Honolulu Museum of Art, Honolulu, Hawaii, commissioned 1922, completed 1927 by Hardie Phillip. Christ Church Cranbrook, Bloomfield Hills, Michigan, 1925–1928. Lihiwai (residence of the governor of the Territory of Hawaii), Honolulu, Hawaii, 1927–1929 (completed by Hardie Phillip). C. Brewer Building, Honolulu, Hawaii, completed 1931 by Hardie Phillip. ^ "American Academy of Arts and Letters - Deceased Members". Artsandletters.org. Archived from the original on 2011-07-26. Retrieved 2012-08-15. ^ Herb Andree et al., Santa Barbara Architecture, from Spanish Colonial to Modern (Santa Barbara: Capra Press, 1980 [later editions avail.]). ^ Andree, Santa Barbara Architecture. ^ Berge Aran, Austin Val Verde, a Montecito Masterpiece (Santa Barbara: Austin Val Verde Foundation, 2005). ^ Herold, Ann (June 2, 2005). "A glorious sight unseen". Los Angeles Times. ^ Daina Julia Penkiunas, American Regional Architecture in Hawaii: Honolulu, 1915–1935 (Ph.D. dissertation, University of Virginia, 1990). ^ a b Penkiunas, American Regional Architecture in Hawaii. ^ Susan and Michael Southworth, AIA Guide to Boston, Third Edition, (Guildford, Connecticut: GPP, 2008), p.29. ^ Said to be similar to Louisville, Kentucky's Church of Our Merciful Saviour, possibly also designed by Goodhue, Marty Hedgepeth (September 24, 1980). "National Register of Historic Places Inventory/Nomination: Church of Our Merciful Saviour". National Park Service. Retrieved March 1, 2018. With photo. ^ Cheever, Mary (1990). The Changing Landscape: A History of Briarcliff Manor-Scarborough. West Kennebunk, Maine: Phoenix Publishing. pp. 102, 104. ISBN 0-914659-49-9. OCLC 22274920. Bertram Grosvenor Goodhue architectural drawings and papers, 1882-1980. Held by the Department of Drawings & Archives, Avery Architectural & Fine Arts Library, Columbia University. Church of St. Vincent Ferrer (New York, N.Y.) architectural drawings, 1908-1928. Held by the Department of Drawings & Archives, Avery Architectural & Fine Arts Library, Columbia University. About the National Academy of Sciences Building, Washington, D.C.
Wikimedia Commons has media related to Bertram Goodhue.